Description: UP Westbound Vehicle Train at Dalhart, Tx. Description: Echo Canyon. Oh yeah, and a UP westbound stack gliding down the Overland Route. Description: Westbound Stack eases down Echo Canyon on the Overland Route. Description: Taken from the hill behind the I-80 westbound rest-uh-rhea. Description: On the point of a westbound stack through Echo Canyon. Description: I know A/C is nice for the hoggers, but I sure do miss being able to catch the engineer's eye and gettin' a wave. Dag-gum tinted windows! Description: Welcome To Palm Springs - UP 4345 rolls eastbound passed the Palm Springs Amtrak Station. Description: NS 338 rumbles through Kannapolis under a strange sky with a catfish on the point. 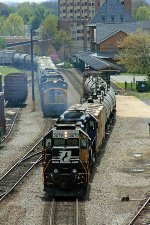 The two Dash 9's on the train, #'s 9013 and 9004 have been assigned to 337/338 along with two other pairs of Dash 9's. Description: The PNWR "Eugene Hauler" waits on Hallawell siding at MP 688, UP Brooklyn Sub for an opposing northbound from Eugene. Description: The PNWR "Eugene Hauler" departs MP 688 on the Brooklyn Sub moments after a UP northbound led by UP 7667 passed by. Description: The PNWR "Eugene Hauler" is about to overtake MP 688, UP Brooklyn Sub as it returns to Albany from Eugene with 15 cars. Description: UP 4345 leads the PNWR "Eugene Hauler" across the Willamette River bridge and over the Lafayette St. trestle at MP 691.8, PNWR Toledo District. Title: UP 4345 and the set out train. Description: Running Elephant Style, a setout train drops cars off at Albany Yard. Set out trains were run while the Pass through the cascades was closed. Description: A one unit stacker rolls into Blair. Description: UP 4345 leads a NB intermodal train just south of Villa Grove. Description: Headed up the ex-CNW, nee-Rock Island Spine Line is UP Train MNLDM 15 on its way to Des Moines, IA. 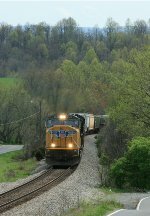 Description: NS 38Q climbing the hill into Bristol with a UP SD70M leader. Description: NS 38Q pulling out from the yard office while V19 idles on the main line. Description: NS V19 shoving back to the yard office while the 38Q waits on a fresh crew.